March 8th, 2019, Charlottetown – P.E.I. speed skaters earned a pair of medals at the inaugural Dartmouth Crossing Sprints speed skating competition in Dartmouth, N.S., recently. 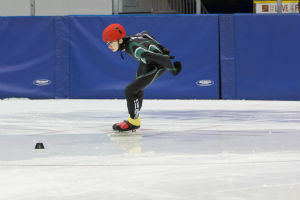 Logan Robbins won a gold medal at the Dartmouth Crossing Sprints speed skating competition. Photo courtesy of Amanda Burke. Logan Robbins took home a gold medal for P.E.I. in division 3 (Special Olympics), while Zack O’Meara captured the bronze medal in division 1. Robbins, in his first year of speed skating, won all five of his races enroute to the gold medal. O’Meara notched a new personal best (“PB”) time in his 1500 metre race and took second place in the 200 metre sprint to secure the bronze medal in the top division. Also competing for P.E.I. were Anderson Arseneau, Baiden Jack and Jordan Koughan. Skating in division 1, Arseneau posted a new PB time in his 200 metre event, while Koughan had a PB in the 500 metre distance to take fourth place in division 3. Jack nabbed PBs in two of three distances enroute to a fourth place finish in division 4. The one-day competition featured 83 skaters from seven Maritime clubs. For full competition results and more information on Speed Skate PEI, visit www.speedskatepei.com.